INFORMACION NACIONAL. 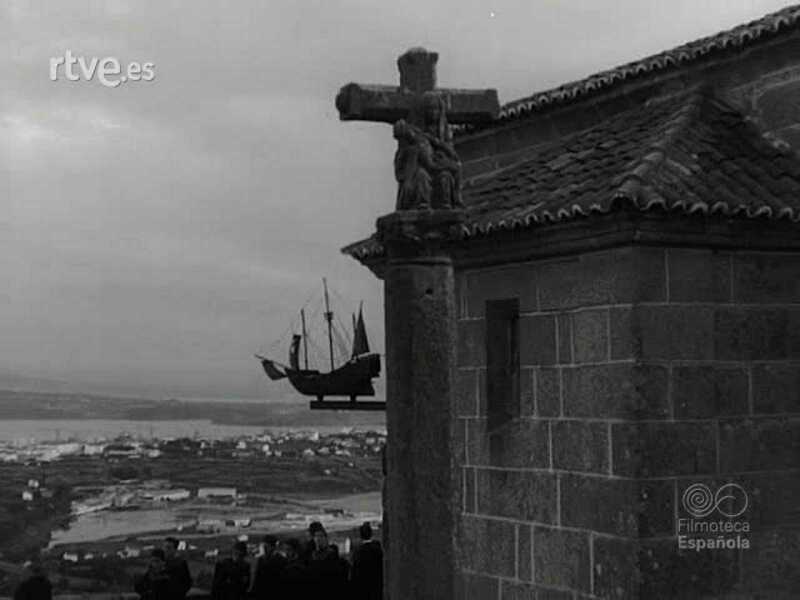 FRANCO EN EL FERROL, SU CIUDAD NATAL. VISITA AL "DOMUS ECCLESIAE" Y A LA ERMITA DE CHAMORRO. UNA GRAN OBRA DE LA INGENIERIA ESPAÑOLA. CONSTRUCCION DEL TUNEL BAO-PUENTE BIBEY. INSTANTANEAS MUNDIALES. PUERTO FRANCO DE ESPAÑA EN EL PARAGUAY. INAUGURACION POR EL MINISTRO DE INDUSTRIA. LUCHA LINGUISTICA EN BELGICA. MANIFESTACIONES DE FLAMENCOS Y VALONES. EXHIBICION DE LA POLICIA DEL BERLIN OCCIDENTAL. UN LLENO EN EL ESTADIO OLIMPICO. DEPORTES. CAMPEONATO DE EUROPA DE MOTONAUTICA EN BAÑOLAS. EL BELGA BOUCQUEY, TRIUNFADOR ABSOLUTO. INFORMACIONES Y REPORTAJES. TEATRO FLOTANTE EN EL LAGO BALATON. UN ESCENARIO QUE VA EN BUSCA DE LOS ESPECTADORES. CAMPEONATOS DE PARACAIDISMO EN FRANCIA. A TRAVES DE LA CAMARA LENTA. ACTUALIDAD NACIONAL. CRIADEROS DE PERDICES. UNA INICIATIVA AFORTUNADA DEL MINISTERIO ESPAÑOL DE AGRICULTURA. NUEVA ACERIA DE ALTOS HORNOS DE VIZCAYA. EL MINISTRO DE INDUSTRIA INAUGURA SU PUESTA EN FUNCIONAMIENTO EN SESTAO. REFLEJOS DEL MUNDO. PRIMER MILENARIO DEL MONTE ATHOS. ACTOS CONMEMORATIVOS CON ASISTENCIA DEL REY EN LA MONTAÑA SAGRADA. CUADROS DE NOVELES EN UNA CALLE DE MUNICH. EL ARTE AL ALCANCE DE LOS TRANSEUNTES. VIDA DEPORTIVA. CICLISMO EN EL MADRILEÑO PALACIO DE LOS DEPORTES. BAHAMONTES Y MANZANEQUE TRIUNFADORES. CAMPEONATOS NORTEAMERICANOS DE NATACION EN CHICAGO. DON SCHOLLANDER LA REVELACION DE LA TEMPORADA. CAMPEONATO ESPAÑOL DE FONDO EN CARRETERA SOBRE PATINES. ELIAS PANIAGUA, TRIUNFADOR. INFORMACION NACIONAL. REGATAS Y EVOCACION DE LAS BATELERAS DE PASAJES. EL ESCENARIO QUE VICTOR HUGO CANTO. BOMBEROS BARCELONESES CAMINO DE ROMA. PEREGRINACION EN "JEEP". DEPORTES. CAMPEONATO EUROPEO DE ESQUI NAUTICO EN BAÑOLAS. EL PRIMER TITULO, PARA EL ESPAÑOL VICTOR PALOMO. COMPETICION NORTEAMERICANA DE ZAMBULLIDAS. TRIUNFO ESPECTACULAR DEL TENIENTE TOM GOMPF. INFORMACIONES Y REPORTAJES. LOS ESTADOS UNIDOS DEVUELVEN A VENEZUELA AL PRESIDENTE PEREZ JIMENEZ. ESTE SERA JUZGADO POR MALVERSACION. CHATARRA CONVERTIDA EN ARTE. LAS ESCULTURAS DE ARMAND, DESPUES DE LA EXPLOSION. PINTORAS ALDEANAS DE ZALIPIE. UN ARTE CAMPESINO, CURIOSO Y ORIGINAL. SALDOS A TODO PASTO. LA HORA DE LAS REBAJAS DESPIERTA LA FANTASIA. INFORMACION NACIONAL. EL CLOWN RIVEL, EN SU PUEBLO NATIVO. UNA FUNCION DEDICADA A SUS PAISANOS. PAJAROS BAÑISTAS. EL VERANEO DE LOS GORRIONES DE MADRID. MADRID Y SU CIRCULACION RODADA. LAS DIFICULTADES DE APARCAMIENTO. VIDA DEPORTIVA. ESQUI DE VERANO EN ALEMANIA. SOBRE LAS PENDIENTES DE CAOLIN DE LA COLINA HIRSCHAU. GRAN CLASE DE LOS NADADORES NORTEAMERICANOS EN TOKIO. MARCAS MUNDIALES SUPERADAS. INFORMACIONES Y REPORTAJES. KRUSCHEF EN BELGRADO. RECIBIMIENTO EFUSIVO DE TITO. VUELVEN LAS MECEDORAS. EL VAIVEN ESTA DE MODA EN EL MUNDO. ESCUELA DE NOTABILIDADES ZOOLOGICAS. CHITA, LA MONA FUTURA ESTRELLA. INFORMACION NACIONAL. MONUMENTO A LOS "CASTELLERS" EN VILLAFRANCA DEL PANADES. TORRES HUMANAS JUNTO A LA ESCULTURA. CIENTO CINCUENTA ANIVERSARIO DE LA LIBERACION DE SAN SEBASTIAN. EN RECUERDO DE LAS VICTIMAS. LISBOA. MANIFESTACION EN LISBOA. EL PUEBLO PORTUGUES EN TORNO A SUS GOBERNANTES. INFORMACIONES Y REPORTAJES. CAMPEONATO EUROPEO DE "SURFING". UN DEPORTE ACUATICO BELLO Y ARRIESGADO. DI STEFANO EN CARACAS, DESPUES DEL RAPTO. RETORNO A MADRID Y PRIMERA JORNADA DE ENTRENAMIENTO. ACTUALIDAD ESPAÑOLA. CRUCERO DE PESCA DEL GENERALISIMO FRANCO. UNA JORNADA A BORDO DE LA MODERNA NAVE "VIMIANZO". REPRESENTANTES DE RIO MUNI EN MADRID. PREPARACION DEL REGIMEN DE AUTONOMIA. INSTANTANEAS MUNDIALES. MARCHA NEGRA SOBRE WASHINGTON. KENNEDY RECIBE A LOS ORGANIZADORES. SEMANA ALPINA DE AEROSTACION. DEMOSTRACION INTERNACIONAL DE GLOBOS DEPORTIVOS. LISBOA. MANIFESTACION EN LISBOA. EL PUEBLO PORTUGUES EN TORNO A SUS GOBERNANTES. INFORMACIONES Y REPORTAJES. UNA PELICULA DE MULTITUDES. RODAJE DE "LOS NOVIOS", COPRODUCCION HISPANO-ITALIANA. LA HORA DE LA MERIENDA EN EL ACUARIUM DE NUEVA YORK. UN CLIENTE DISTINGUIDO. ACTUALIDAD NACIONAL. EL OBISPO DE MADRID-ALCALA Y PATRIARCA DE LAS INDIAS, HA MUERTO. REPORTAJES RETROSPECTIVOS Y ENTIERRO. NUEVO TETRARREACTOR PARA LAS LINEAS ESPAÑOLAS. EN VUELO DIRECTO DE LOS ANGELES A PALMA DE MALLORCA. DEPORTES. CAMPEONATO ESPAÑOL DE BOXEO WELTER JUNIORS, EN BARCELONA. GALIANA CONVALIDA EL TITULO. LISBOA. MANIFESTACION EN LISBOA. EL PUEBLO PORTUGUES EN TORNO A SUS GOBERNANTES. INFORMACIONES Y REPORTAJES. JUSTAS ACUATICAS EN PONT EVEQUE. TORNEO DEL CAMPEONATO DE FRANCIA. LA INSTALACION DEL TELETIPO MOSCU-WASHINGTON, TERMINADA. ACTIVIDAD DIPLOMATICA EN LA CASA BLANCA. IV FESTIVAL DE LA CANCION EN ARANDA DEL DUERO. "BESO ROBADO" PRIMER PREMIO. ACTUALIDAD ESPAÑOLA. INAUGURACION DEL SALTO DE BELESAR POR S.E. EL JEFE DEL ESTADO. LA NUEVA CENTRAL LUCENSE INCREMENTA LA PRODUCCION ELECTRICA DE GALICIA. XI CURSILLO ESCOLAR MUNICIPAL DE EDUCACION FISICA Y NATACION. CLAUSURA Y EJERCICIOS EN LA CASA DE CAMPO DE MADRID. TOROS. CORRIDA DE FERIA EN ALCAZAR DE SAN JUAN. ORTEGUITA, PEDRES Y EL CORDOBES EN EL CARTEL. INFORMACIONES Y REPORTAJES. JAYNE MANSFIELD VISITA BUDAPEST. RUEDA DE MICROFONOS EN TORNO A LA ESTRELLA. UN CASTILLO DE HACE CUATROCIENTOS AÑOS. COMO EN TIEMPOS DE LOS VIEJOS CABALLEROS. CAMPEONATOS DE PARACAIDISMO EN FRANCIA. A TRAVES DE LA CAMARA LENTA. ACTUALIDAD ESPAÑOLA. NUEVA EMISORA DE RADIO NACIONAL EN LA CORUÑA. EL MINISTRO DE INFORMACION Y TURISMO MANUEL FRAGA IRIBARNE INAUGURA LAS INSTALACIONES. HOMENAJE DE BARCELONA EN MEMORIA DEL ACTOR ENRIQUE BORRAS. EN EL CENTENARIO DE SU NACIMIENTO, EXPOSICION DE FOTOS DEL ACTOR. FRAGMENTO DE UNA INTERPRETACION DE LA OBRA EN FLANDES SE HA PUESTO EL SOL, DE EDUARDO MARQUINA, POR EL ACTOR ENRIQUE BORRAS. REFLEJOS DEL MUNDO. EL AUTOMOVIL FLOTANTE. INVENTO DE UN ESTUDIANTE ESTADOUNIDENSE RESIDENTE EN PUERTO RICO. HIERRO EN EL DESIERTO DE MAURITANIA. SU DESCUBRIMIENTO CONTRIBUYE A LA TRANSFORMACION DEL PAIS. INAUGURACION DE LAS INSTALACIONES. DEPORTES. XXIII REGATA DE TRAINERAS EN HONOR DEL GENERALISIMO FRANCO, EN LA CORUÑA. PRESENCIAN EL EVENTO FRANCISCO FRANCO Y AGUSTIN MUÑOZ GRANDES, LA TRAINERA "VIRGEN DEL CARMEN" DE MEIRA-MOAÑA, TRIUNFADORA. INFORMACIONES Y REPORTAJES. EXPOSICION EN LA CARCEL NORTEAMERICANA DE SAN QUINTIN. TAMBIEN LOS ARTISTAS RECLUSOS VENDEN CUADROS. CAMPEONATOS DE PARACAIDISMO EN FRANCIA. A TRAVES DE LA CAMARA LENTA. ACTUALIDAD ESPAÑOLA. S.E. EL JEFE DE ESTADO INAUGURA UN COMPLEJO INDUSTRIAL DE CELULOSA EN PONTEVEDRA. PRODUCIRA AL AÑO MAS DE CIEN MIL TONELADAS DE PASTA DE PAPEL. EN EL PALACIO DE JUSTICIA DE MADRID. SOLEMNE APERTURA DEL AÑO JUDICIAL. LA CRUZ ROJA ESPAÑOLA EN ACCION. I JUEGOS NACIONALES PARA NIÑOS INVALIDOS. INSTANTANEAS MUNDIALES. TOKIO SE PREPARA PARA LOS FUTUROS JUEGOS OLIMPICOS. GRAN IMPULSO A LAS OBRAS DE INSTALACION. EN BUSCA DE LOS RESTOS DEL SUBMARINO "THRESSER". EL BATISCAFO "TRIESTE" DESCIENDE A LAS PROFUNDIDADES. DEPORTES. LA XLIII VUELTA CICLISTA A CATALUÑA. VICTORIA DE JOSE NOVALES. INFORMACIONES Y REPORTAJES. EL ACTOR NORTEAMERICANO BOP HOPE EN LA CASA BLANCA. KENNEDY LE CONDECORA CON UNA MEDALLA DE ORO. COMETAS CON TRIPULANTE HUMANO. VICHY, ESCENARIO DEL PRIMER CAMPEONATO MUNDIAL. ACTUALIDAD ESPAÑOLA. EL GENERALISIMO FRANCO EN SANTIAGO DE COMPOSTELA. ENTREGA DE TITULOS TRAS LA CONCENTRACION PARCELARIA. INAUGURACION DE VEINTE GRUPOS DE LA I FASE DEL PLAN DE CONSTRUCCIONES ESCOLARES EN MADRID. INAUGURACION POR LOS MINISTROS DE EDUCACION NACIONAL Y VIVIENDA. NUEVOS COLEGIOS. NOTICIAS MUNDIALES. INTEGRACION MILITAR FRANCO-ALEMANA. EL ESPIRITU DE HERMANDAD SUSTITUYE A LAS VIEJAS DESAVENENCIAS ENTRE FRANCIA Y ALEMANIA. FESTIVAL DE VENECIA. PREMIOS: CORTE VOLPI PARA LA MEJOR ACTRIZ DELPHINE SEYRIG EN MURIEL O EL TIEMPO DE UNA VUELTA. MEJOR ACTOR ALBERT FINNEY POR TOM JONES. PREMIO ESPECIAL PARA LOUIS MALLE POR LE FEU FOLLET. PREMIO DE LA CRITICA PARA LUIS GARCIA BERLANGA POR EL VERDUGO. IGOR TALANKIN POR INTRODUCCION A LA VIDA O VSTUPLENIE. "EL LEON DE ORO" PARA FRANCESCO ROSI POR LAS MANOS SOBRE LA CIUDAD O LE MANI SULLA CITTA. DEPORTES. CAMPEONATOS AMERICANOS DE TENIS. PARTIDOS FINALES EN FOREST HILL, NUEVA YORK. ESQUI ACUATICO EN VICHY. ESPECTACULAR EXHIBICION DE JEAN MARIE MULLER. INFORMACIONES Y REPORTAJES. LOS REYES DE AFGANISTAN MOHAMMED ZAHIR SHAH Y SU ESPOSA HUMAIRA BEGUM EN WASHINGTON, LES RECIBE JOHN F KENNEDY. LOS REYES DE AFGANISTAN LLEGAN A LA BASE AEREA DE TORREJON DE ARDOZ, DONDE LES RECIBE EL MINISTRO DE INFORMACION Y TURISMO, MANUEL FRAGA IRIBARNE. CONTINUAN CON SU VIAJE A KABUL. FANTASIAS SOBRE EL HIELO. EL ESPECTACULO DE LOS "ICE CAPADES", EN ATLANTIC CITY. CON LOS PATINADORES HERMANOS OTTO Y MARIA JELINEK, Y EL JAPONES HISASHI KUCHIKI. INFORMACION NACIONAL. VACACIONES DEL JEFE DEL ESTADO. ESCENAS FAMILIARES EN LA PLAYA. UN ALTAR BAJO LAS AGUAS DEL CANTABRICO. LA VIRGEN DE BEGOÑA ENTRONIZADA A 12 METROS DE PROFUNDIDAD. REFLEJOS DEL MUNDO. REPORTAJE EN SAIGON, ESCENARIO DE LUCHAS. LOS BONZOS ACAUDILLAN UN MOVIMIENTO RELIGIOSO. ELECCION DE GUAPAS EN SALSOMAGGIORE, ITALIA. "MIS CINEMA", "MIS SONRISA" Y "MIS ITALIA". DEPORTES. PRUEBAS FINALES DE ESQUI ACUATICO EN VICHY. NORTEAMERICA SE CLASIFICA EN PRIMER LUGAR. INFORMACIONES Y REPORTAJES. COMO SE HACE UN CARTEL DE CINE. EL ARTISTA EN SU TALLER. ACROBACIAS AUTOMOVILISTICAS EN FLORENCIA. PARECE IMPOSIBLE, PERO ES VERDAD. ACTUALIDAD NACIONAL. TRAS LOS ULTIMOS TEMPORALES EN LEVANTE. LA ALAMEDA DE VALENCIA CONVERTIDA EN SECADERO DE ARROZ. "EL DIA DE AMERICA" EN ASTURIAS. DESFILE DE CARROZAS Y GRUPOS FOLKLORICOS. INFORMACIONES Y REPORTAJES. FERIA DEL AUTOMOVIL EN FRANKFUR. PARTICIPAN MIL FIRMAS EUROPEAS. MODAS AMERICANAS EN PARIS. LA PANA, TEJIDO DE ACTUALIDAD. LOS HELICOPTEROS, INCORPORADOS AL SERVICIO DE AUXILIO EN CARRETERA. CONTROL, VIGILANCIA Y AUXILIO AL ACCIDENTADO. DEPORTES. CAMPEONATOS ALEMANES DE PIRAGUAS EN EL RIO RHUR. ESPECTACULAR PRUEBA DEPORTIVA. INFORMACION NACIONAL. EL XIV CONGRESO INTERNACIONAL DE MEDICINA DEL TRABAJO, EN MADRID. PARTICIPACION DE TRES MIL CONGRESISTAS. III FESTIVAL DE LA MANZANA EN VILLAVICIOSA. DESFILE DE CARROZAS EN OVIEDO. REFLEJOS DEL MUNDO. VIEJO TREN REDIMIDO DE LA CHATARRA. ACONDICIONADO POR UN GRANJERO ALEMAN. LA PRINCESA SORAYA EN GRECIA. REPORTAJE EN LA ISLA DE MYCONOS. FUNICULAR A TRES KILOMETROS DE ALTURA. ATRAVIESA EL VALLE DE PALM SPRINGS, EN CALIFORNIA. INFORMACIONES Y REPORTAJES. V FESTIVAL DE LA CANCION MEDITERRANEA EN BARCELONA. TRIUNFO DE LAS CANCIONES ESPAÑOLAS. EL PARAISO DE LOS PERROS. HOTEL-RESIDENCIA E INSTITUTO DE BELLEZA.